The next edition of the Conference on Reversible Computation will take place September 13-14, 2018, in Leicester, UK (tentative abstract submission deadline is April 10, 2018 and tentative submission deadline is April 17, 2018). Further information will follow soon. 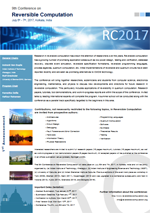 The 9th Conference on Reversible Computation will take place on July 6th and 7th, 2017 in "The Pride Plaza Hotel", Kolkata, India and is jointly organized by: (a) Indian Institute of Technology, Kharagpur, (b) Indian Institute of Engineering Science and Technology, Shibpur, (c) Indian Statistical Institute, Kolkata, (d) Jadavpur University, Kolkata, and (e) University of Calcutta, Kolkata. Program for the conference and summer school. Proceedings are available through this link. Photos are available through this link.